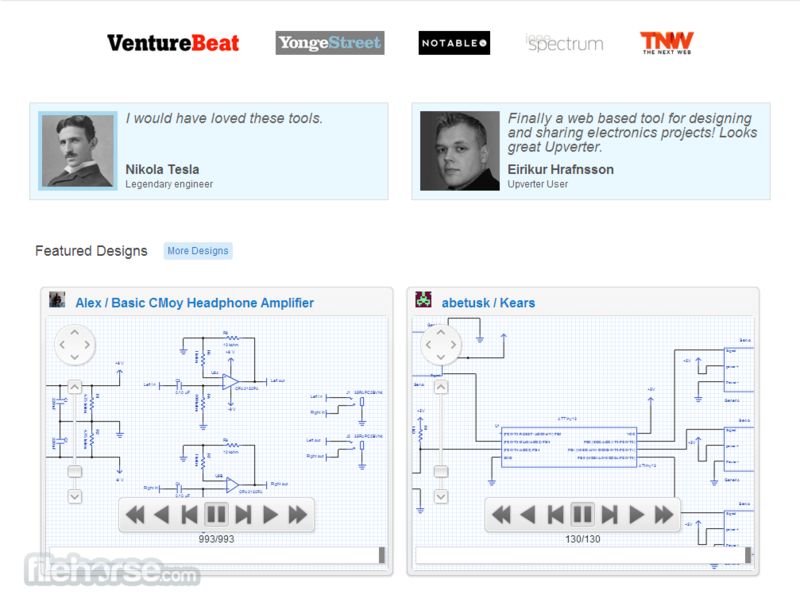 Upverter is a powerful online tool for creating schematic for your hardware, motherboards and other electrical projects. 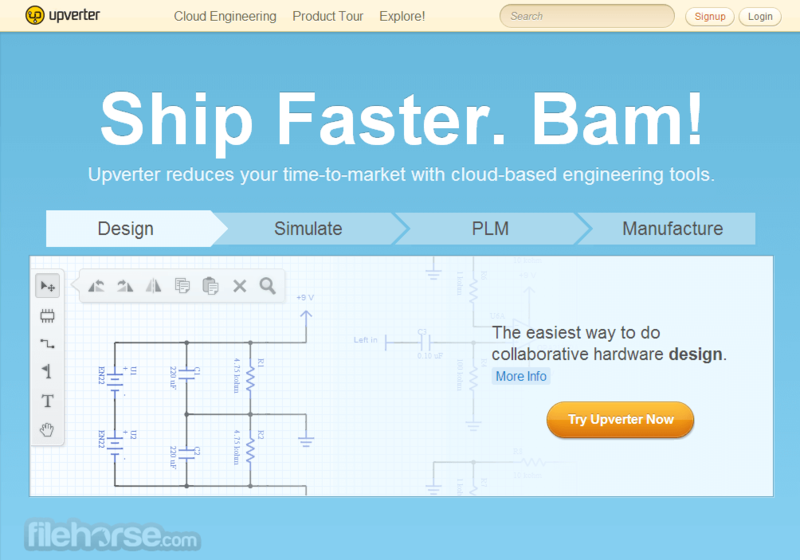 Powered by highly capable CAD tools (Computer Aided Design) tools that can make even the most complicated project easy to use and manage, Upverter will be invaluable tool for electrical engineers, students, professors, and electrical enthusiasts that are eager to harness the power of cloud computing. Sharing electronics projects now! Editor is easy to use and full of useful tools. No matter what you are creating, everything you need will be clearly accessible and ready to be used. Advanced users will be happy to know that Upverter has a database od advanced real word parts from many major manufactures. These parts can be integrated in your projects, and they come with actual real model numbers, specifications, voltage capabilities and pin identifiers. One of the most useful features of Upverter is its community tools that enable collaboration on projects. With help of your friends, co-workers and general public no projects can remain unfinished! Tinkering with electrical design is a past time and a job for hundreds of thousands of people from all around the world. With the arrival of modern PCs and fully developed internet infrastructure, process of designing fully operating schematic designs and PCBs became much easier with numerous CAD apps (Computer Aided Design) that can help anyone from novices to professionals to easily design electrical items and schematics. If you are knowledgeable, even ordinary MS paint where you can manually draw can be helpful to you, but for much more streamlined pipeline of creation, we fully recommend you Upverter, one of the most popular editors for your own electrical contraptions. With support for both free and premium service, Upverter can help you to easily test your designs, iterate with speed, collaborate with your friends or colleagues, and take account of all your materials. 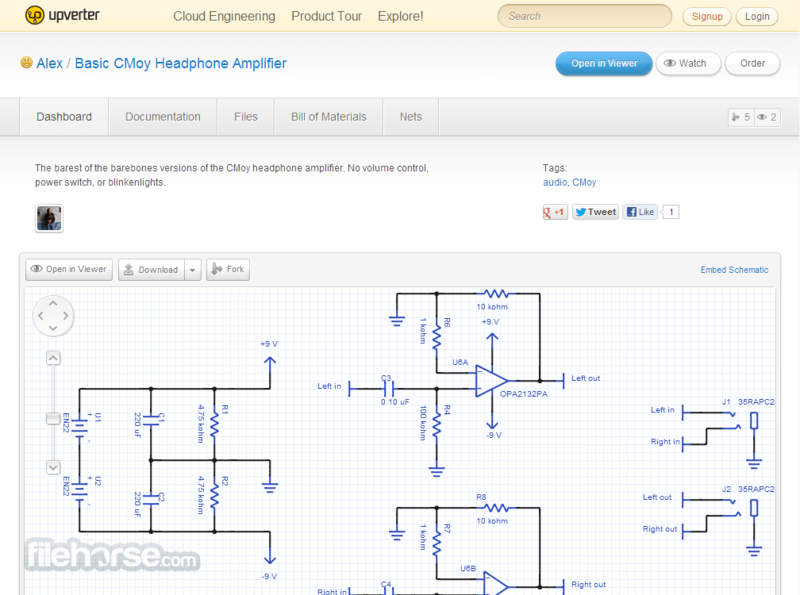 Upverter is one of the best online apps for creating electrical schematics, PCB layouts and hardware design with great tools, easy way to iterate and review your product, take advantage from all the help your team can give you, and easily manufacture and ship your hardware design.With full support for user-friendly collaborative tools, you can easily take advantage from all the tools that Upverter has to offer and base your entire hardware design pipeline around it. Upverter supports open source and public design showcase that is perfect for enthusiast, students and novices, while professionals can create private projects that will safeguarded in secure and reliable cloud storage architecture (all data is protected with AES 256-bit encryption and ISO 27001-compliant data centers). Open projects that you find on the site can be forked into your own designs, enabling you to quickly iterate upon designs of other users. Design tools of Upverter are comprehensive, with support for all types of electrical and PCB equipment, with comprehensive library of real-world parts from major manufacturers that you can incorporate in your own designs. Those real-world parts are not only non-interactive blocks, but fully integrated editor pieces that have their own clearly labeled electrical connectors that can help you to completely control your design process and easily see where can problems arose. Finally, when your design is finished, you can access “Bill of Materials” section and see pricing for all your components. With great tools, interface and several pricing schemes, Upverter represents invaluable tool for product designers. Sharing electronics projects now! Interface of Upverter is every easy for use, enabling both novices and professionals to easily take advantage from all of its tools. Main editor of the app features easy to use tools and drawing surface where you can place your objects and wiring lines (they can be places only horizontally or vertically). Tools are placed on the left bar, with easy access to everything you will need (including tool for manual text entry and notation). Each project that you make or that you view on Upverter listings has several distinct sections – Dashboard, Schematic, Documentation, Files, Bill of Materials, and Nets. 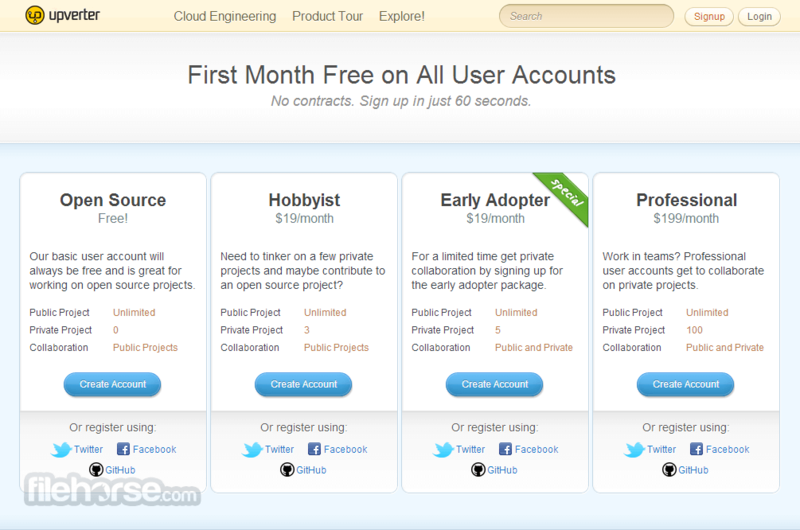 Upverter can be used for free, with access to unlimited open-source designs and collaboration tools. Paid subscription comes in two varieties – “Awesome” $7/user/month tier that unlocks private collaboration and private designs and “Professional” $7/user/month tier that adds support for issue tracking, design review, cadence import, PDF import and altium import. All premium tiers can be tested for free in a 30-day trial period. Electrical design becomes easy and streamlined with Upverter. We fully recommend you to try this professional tool even if you only intend to use its free version. Contribute to and take advantage of the open-source hardware community. Design schematics and pcbs collaboratively using Upverter online editing tools. Take advantage of the cloud to run as few or as many simulation jobs as you want. Upverter extensive parts library is crowd-sourced and maintained for you. Create, compare, and order your bill of materials from a variety of worldwide suppliers. Export everything you need to move into mass manufacturing.